Home Pageant Controversy RUMOR MILL : No Miss Venezuela in Miss Universe 2017? RUMOR MILL : No Miss Venezuela in Miss Universe 2017? There are rumors circling the pageant community that beauty pageant powerhouse Venezuela won't be sending a delegate for the 66th edition of Miss Universe pageant due to the financial crisis. 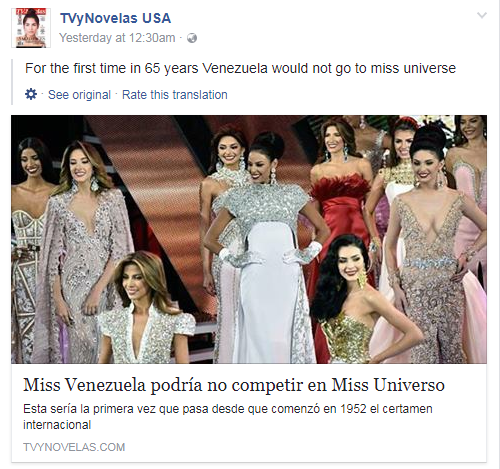 According to an article posted at TVyNovelas website (TVyNovelas is a Mexican magazine published by Editorial Televisa on a monthly basis), Miss Venezuela 2016-2017 Keysi Sayago would not compete in the upcoming edition of Miss Universe as Miss Venezuela Org's Osmel Sousa could not provide franchise payment with MUO. For the first time since the 1952 World Beauty Fair began, Venezuela may not send a representative to it. Although it is no secret that the country is going through a difficult social political situation, the Miss Venezuela contest is a tradition of so strong a roots in national culture, that (although with work), the 2017 edition is already being prepared. In fact, Keysi Sayago, the current Miss Venezuela and to represent the country in Miss Universe 2017, was selected on October 6 last year and has since been preparing for international competition. The big problem is that so far, the Miss Venezuela Organization has not been able to pay the annual franchise fee required by the Miss Universe Organization to accept its candidate. This figure changes by country and it is known that in the case of Venezuela around 100 thousand dollars per year. There is, however, an exception for not paying the annuity. When the candidate of a country wins the crown, the next year does not have to pay. That is why in the last 8 years the company that runs Osmel Sousa has saved the negligible amount of 300 thousand dollars. This is because Venezuela won the editions of the years 2008, 2009 and 2013. 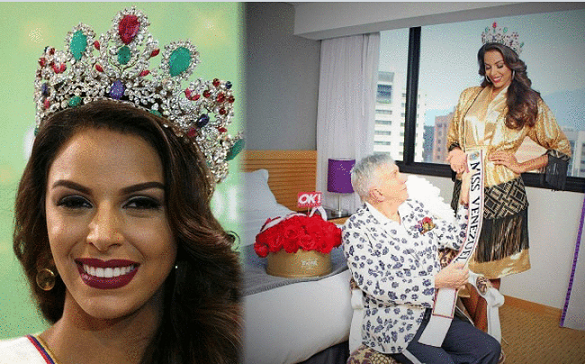 Sayago hopes that the money will still be collected and her dreams of representing her country in Miss Universe can be fulfilled. And is that in the history of Miss Venezuela there is a similar antecedent that had a happy ending. 'In 2003 Mariangel Ruiz was informed that she would not go to the international competition because the national organization could not pay the annuity. The girl did not give up and continued with her training. At the last minute they managed to raise the $ 70,000 needed at that time and Ruiz was able to join the contest. And when we say "last minute" was so so when the beautiful aragüeña arrived at the headquarters of the contest for a week that this had begun. It is worth noting that although she arrived with difficulties and at the last minute, the Venezuelan obtained the position of 1st finalist of the Miss Universe 2003, only being surpassed by the eventual winner, the Dominican Amelia Vega. Will Keysi Sayago run with the same fate? Venezuela is suffering the worst economic crisis in its history. It may be the biggest political crisis in Venezuela in years and Osmel Sousa's organization has been suffering lately because of difficult economic conditions. In 2003, Miss Universe First Runner-Up Mariángel Ruiz almost missed the competition in Panama because of economic crisis. And the pageant world was shocked when beauty maker Osmel didn't send a delegate for Mister World 2016, the first time in Mister World history. In 2016's Miss Venezuela pageant, the organization only crowned delegates for Miss Universe and Miss International and just appointed Diana Croce as the representative for Miss World 2016 after the national pageant. The organization had been sending Venezuelan beauties for Miss Earth since 2010 but stopped due to problems with funds. The Miss Earth franchise for Venezuela was acquired by Miss Earth 2013 Alyz Henrich. I highly doubt that the organization won't send Keysi Sayago for Miss Universe 2017 pageant. Miss Universe is the most awaited beauty pageant event in Venezuela and we are sure that they could provide funds, a private sector might be stepping in to help fund the costs of Miss Universe franchising fee. Let's see what's gonna happen next! We hope and pray that conflicts in Venezuela will end soon.